The painting is now in the collection of pvmuir! Congrats pv, and thank you! Click here to view the auction. 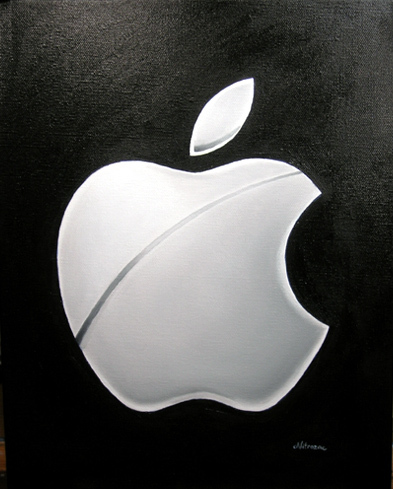 Hmmm, this could be one of the worst times for me to offer up my latest work, a large oil painting of an Apple logo. Apple Inc. has been acting nasty lately, and many Apple geeks have been losing that glow of love they usually feel for her. But sure, we might be a little sore from the brow-beating we've been suffering from the iPhone price cut and Apple's position on locking up the iPhone, but hey, it's Apple we are talking about here. Apple is like family; you have a spat, and they can drive you crazy, but eventually you get over it, and go back to being a loving family again. The painting is big, bold, and commanding! If you are a fan of Apple, you need this in your collection, and you are going to love it. It's an iconic work that reminds me a little of the Monolith from 2001... stand in front of the painting and prepare to evolve to the next level! Of course on another level, it is also emblematic of the corporate culture that has shaped our society and world we live in today. That's partly why the logo is painted with a dark background. The rich, black paint with its lush brush stokes serves as the ideal compliment to the light shading and gradation of the logo and really makes the logo pop out, but if you are so inclined to imagine, it is also representative of the darker side of Apple. Details: "Shiny Apple" is Nitrozac's 31st painting of her Painting Blog. It's an oil painting, on 11 x 14 inch stretched canvas. The painting will be dry and ready to ship in about a 2-3 weeks after the auction ends.. The back of the painting will contain the title, the date painted, Nitrozac's signature, and a fingerprint for authenticity. If the painting isn't sold at this auction, it will be offered for sale at a higher price on our webstore. Best of luck to all bidders! Shipping for each painting is extra... to the US and Canada it is 12 dollars, to other locations, 25 dollars. All prices in Canadian dollars, and please Note: Canadians will be charged any appropriate taxes (GST (and PST if the bidder is from British Columbia) in addition to the sale price.